WOW! I never thought I would taste a brownie again that was as good as the one that I just had. Thankfully Locali, a great eco- and gluten free-friendly shop in Hollywood (see my previous post about Locali here) tweeted me to let me know they had some Shrewd Foods brownies in stock. I bought two brownies, a dark chocolate and a mint chocolate. I just had the dark chocolate and again, WOW. It was moist, warm, and altogether amazing. I am shocked that a packaged gluten free brownie can taste so good. If you are a chocolate aficionado or just looking for a great mid-afternoon snack, you MUST try these Shrewd Foods brownies! Best of all, these brownies are *relatively* well-priced in comparison to some other gluten free products out there. They cost $2.99 each -- I know that I've visited some bakeries in the past that have charged as much as $8 for a single gluten free treat!! It's also packed with 11 grams of protein and doesn't use any refined flour and contains 5 grams of fiber. I absolutely LOVE this brownie! It is also marked gluten free on the front and back of the packaging. 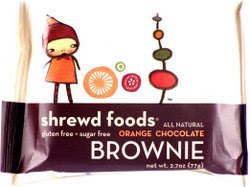 The website for Shrewd Foods does not seem to be working as of 5/10/09, so I do not know where else this product is available. Nor do I know what other flavors, although according to another gluten free blogger the brownies are available in Dark Chocolate, Mint Chocolate, Fudge Walnut, and Orange Chocolate (as in the photo above). In the meantime, stop by Locali and support a locally-owned & operated business! Check out my previous post on Locali here. P.S. Follow me on Twitter here; follow Locali on twitter here. Locali is one of the best businesses I know of on Twitter because they respond quickly to my tweets!